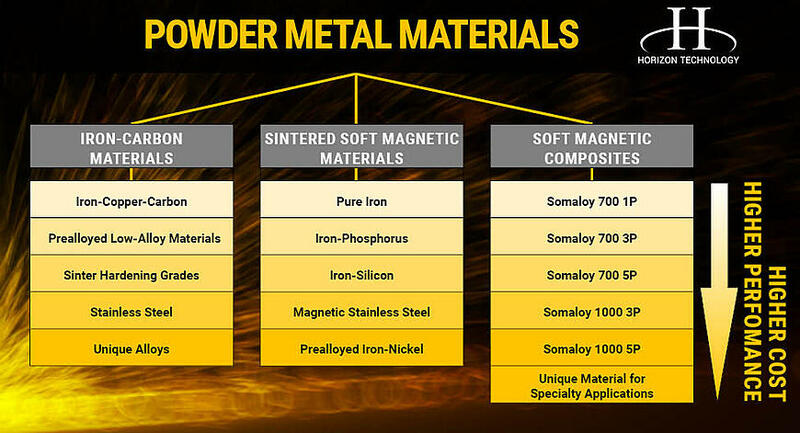 Powder Metal Materials: A Visual Flow Chart of Possibilities. About 80% of the powder metal industry -- and its customers -- are stuck in an old set of technologies and can generate certain component performance numbers. But if you move to more advanced materials and processes, you can improve your product beyond what’s out there today. Powder metal is highly diverse. It’s also very scientific, and admittedly can cause headaches if you’re a purchaser or wet-behind-the-ears engineer. Sometimes it’s easier to visual things in chart form. As you go down the flow chart, performance will increase, but so will price. Check out the descriptions below to see which material might be best for your project. This family of PM materials are premixes of iron and graphite to form essentially carbon steels. They are used in low strength applications such as self-lubricating bearing and many shock absorber components. Purchasers have long considered it the standard for powder metal materials -- about 50% of North American powder metal parts are made from iron-copper-carbon (ICC). ICC is so popular in part because it’s very easy to process. Manufacturing with ICC powder tends to be pretty forgiving if you undersinter, oversinter, etc. compared with more advanced materials. Think of ICC as merely a starting point for powder. Sometimes it works fine; sometimes it’s simply not adequate and you need to explore the dozens of other possibilities out there. Iron-copper-carbon tends to be brittle, porous, and dimensionally wonky. These PM materials have all of their alloying elements combined with the iron during the melting stage of the iron powder. Typically, the most common alloying elements used in iron powder metallurgy are molybdenum, nickel, and to a lesser extent chromium. The advantages of these materials are a uniform microstructure after heat treatment. A potential disadvantage can be a reduction in compressibility resulting in lower densities during compaction. Sinter hardening is a process in which the PM part can be cooled sufficiently quickly during the sintering process to generate a predominantly martensitic microstructure. These materials generally have greater alloying content that traditional prealloyed low alloyed material. The advantages of the sintering hardening material in the ability to skip a separate quenching step with the possibility of reduced dimensional distortion and reduced component cost. Stainless steels have inherently much greater corrosion resistance compared to steel materials. Typical grades include the 300 and 400 series plus some precipitation hardening grades such as 17-4 PH. Because PM materials utilize a premixing step prior to compaction; it is possible to incorporate specialized additives that can give unique physical properties. For example, it is possible to incorporate additives that promote great part dry lubrication, higher wear resistance or non-traditional alloying elements. If the additive can withstand the sintering step, this unique aspect of PM can significantly expand the potential usages for PM. If you’ve got something a little out of the ordinary, find a powder metal manufacturer willing to try it! Pure iron powder grades are born from atomization or reduction. These powders are the basis for most mixes of low-alloyed sintered steels. High-purity iron has excellent soft magnetic qualities. A vendor can use coated or insulated iron to add new design options to your tool kit. Note that resistivity in pure iron is very low. Iron-phosphorus materials feature high induction, strength, and hardness. Their resistivity is better than iron, but still not good. It’s notable that this alloy’s high ductility allows for riveting operations. Iron-silicon sintered parts respond better than iron-phosphorus sintered parts to moderate frequencies. It can take a hit, so this material sees use in application where impact is involved. These powders are also useful in applications where high surface areas are on your wish list. 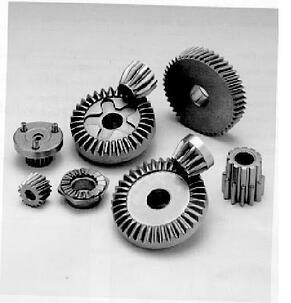 Stainless steels used in powder metallurgy are mainly ferritic grades mainly used in corrosive environments. Martensitic stainless grades 409L and 434L are good examples. Note that this category says “magnetic,” unlike the previous entry on stainless steel. The popular 300 series of stainless steel grades is NOT magnetic. As for induction, stainless steel generally has a lower rate than iron or iron-phosphorus powders. Some PM companies can put a non-magnetic stainless steel part with a magnetic part to assemble a unique application. Iron-nickel prealloyed materials are 50% nickel and 50% iron. Nickel is unique among nonferrous metals in that it’s magnetic. It’s great for applications requiring high corrosion resistance. Low induction and low applied fields are trademarks of iron-nickel. Thanks to its high permeability, this material provides lightning-fast response to an applied current. High density is achievable, too. Soft magnetic composites (SMCs) are compacted, but instead of being sintered, they get a lower-temperature heat treatment to cure the insulation product around each particle. SMCS are great for AC applications, such as household electric motors. You can also learn more about soft magnetic composites here. Heat treatment helps give the metal impressive magnetic and mechanical strength. The “1P” in the name means you press the part and process it in a single fashion -- strictly in an air atmosphere. The 1P series is considered the most economical baseline option for soft magnetic composite. Heat treatment is also used here to give great magnetic qualities and other benefits. “3P” means the manufacturer presses your material as before, but takes things a bit further. The manufacturer compacts your powder, then adds a magnetic oxide coating. This extra work promotes higher permeability and outstanding mechanical strength. The temperature used is below the annealing temperature of iron, so core losses are reduced relative to the 1P process, but still not fully optimized compared with 700 5P. Once again, heat treatment provides impressive magnetic and mechanical qualities. A 5P soft magnetic composite is created in a slightly higher-temperature atmosphere containing nitrogen. This time, the temperature used causes your compacted iron powder to anneal. The benefit of this unique processing? Lower core losses than 1P and 3P. The makers of Somaloy 1000 3P optimized it for maximum B-H characteristics and strength. The B-H curve (basically another way of saying the hysteresis loop) represents the necessary applied field required to achieve a certain level of magnetic induction. This material features relatively low resistivity similar to 500 1P. This is the highest-density and lowest-core-loss material of the SMC family. It has a permeability approaching 1,000 but is heat treated at a temperature that begins to partially anneal the cold work induced during compaction of your component. Do you have something a little out of the ordinary? Powder metal is the place to test it out. You’d be surprised what kinds of creative solutions the most advanced PM manufacturers can dream up -- and bring to reality. To learn more about the far-right branch -- soft magnetic composites -- check out the free downloadable below.